Heat oven to 375°F. In small bowl, mix sugars, tapioca, cinnamon, salt and orange juice. Make pie crusts as directed on box for Two-Crust Pie using 9-inch glass pie plate. Place rhubarb in crust-lined plate; sprinkle with half of sugar mixture. 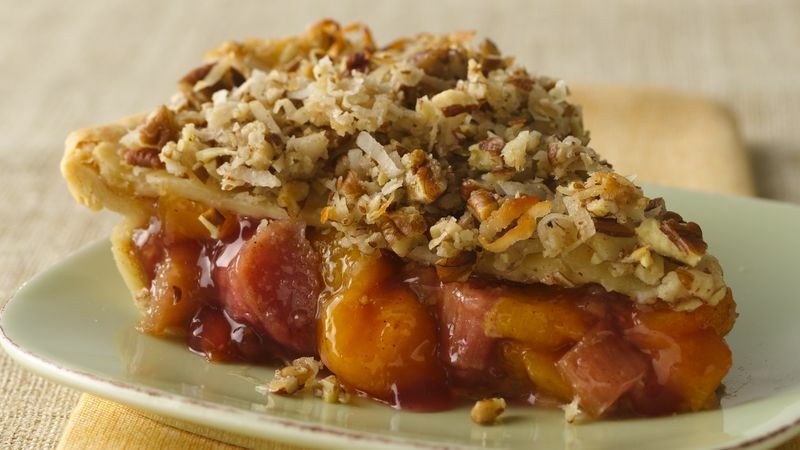 Top with peaches; sprinkle with remaining sugar mixture. Top with second crust and flute; cut slits in several places. Bake 35 minutes. Meanwhile, in small bowl, mix topping ingredients; sprinkle over top crust. Bake 10 minutes longer or until golden brown. Cool at least 2 hours before serving. This pie recipe by Margaret Miller of Burdett, Kansas, won the Pillsbury Refrigerated Pie Baking Championship at the 2009 Kansas State Fair. Slices of this pie can be topped with whipped cream or slightly softened vanilla ice cream just before serving, if desired.